Tourist Police commander Pol. Lt. Col. Piyapong Ensarn and Marine Department officials inspected 14 speedboats and a parasailing boat Sept. 11. Two speedboat drivers were fined 1,000 baht each for not having their license on board. Tourist Police commander Pol. 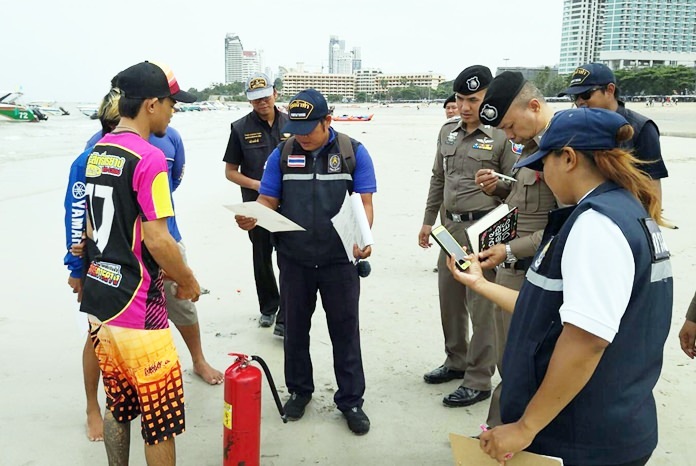 Lt. Col. Piyapong Ensarn and Marine Department officials inspected 14 speedboats and a parasailing boat Sept. 11 as part of the ongoing effort to enforce marine safety regulations. Neither Tatpol Apisitpaiboon, driver of the Eakachai 3, and Somchai Prangthong, driver of the Luk Kim, could produce their licenses and were dinged 1,000 baht.